Adobe Business Catalyst gives designers the ability to deliver complete online business solutions, not just websites. Business Catalyst provides site management, integrated ecommerce, a selection of pre-built data-driven modules, as well as reporting and analytics tools. I know youâ€™re skeptical. Letâ€™s face it: all-in-one solutions have a bad track record. Typically, a provider may do one thing well, then try to add on features to differentiate themselves from the competition. Unfortunately, those features fall short of what you need for your client. And in a way, this makes sense, doesnâ€™t it? Your plumber might be great, but do you want him as your dentist too?The good news is that Adobe comes to the table with an extremely robust set of meaningful features that will let you partner with your client to help them grow their online business, not just their website. That means you can spend less time worrying about, well, the plumbing on the solutions you deliver; instead, you can spend more time creating value and increasing your and your clientâ€™s revenue. By the time youâ€™re done, youâ€™ll have a all the know-how required to set up a fully-featured ecommerce site with a customer database and email marketing capabilities. Youâ€™ll also have the knowledge to answer our Adobe-sponsored Article Quiz! Take some time to explore the tools and get familiar with the waytheyâ€™re organized. Once you run through them, youâ€™ll find that the tools become intuitive, and you can easily understand the conventions that youneed to adopt. Adobe acquired a mature platform when they bought Business Catalyst, and it has very strong contextual help and support that provides instruction and examples. The Adobe team has also built good text-based and webcast-style support tools. Now, letâ€™s get started building a site.If you want to â€œmove inâ€� to Business Catalyst, thereâ€™s a helpful site importer which will take your existing site and import it into the system. 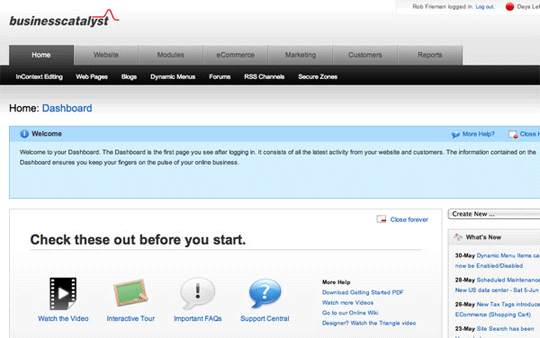 You can modify and configure the site from there. 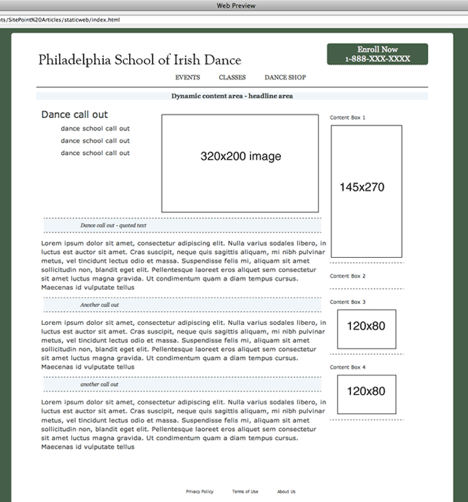 However, weâ€™re going to start from scratch in this tutorial.Adobe Business Catalyst has very deep integration with Dreamweaver CS4 and CS5, and this makes moving between environments an almost seamless process. However, Iâ€™m going to keep things simple and work in the web-based tool for this walkthrough. Letâ€™s take a look at the design Iâ€™ve come up withâ€”as FigureÂ 2, â€œThe interface designâ€� reveals, so far, itâ€™s just a shell. 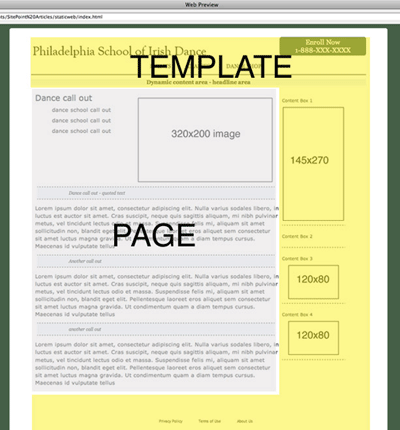 Iâ€™m a big fan of planning; as the saying goes: â€œMeasure twice, cut once.â€� As you can see in FigureÂ 3, â€œUnderstanding the template and the pageâ€�, Iâ€™ve identified areas in the template for images and text, and Iâ€™ve worked out aÂ simple navigation scheme. Iâ€™m going to get started by planning out a template and a page. Adobe Business Catalyst is a very mature product that never leaves you stranded. The navigation always gives you a route home, or at least to a familiar place. If youâ€™re not sure about something, you can cancel or navigate away before you commit a change to yourÂ project. In addition, every time you click Save and Publish for a web page, the event is logged in an audit trail, so you can roll back to a previous version of a page, template, or product at any time. There are also multiple paths to some of the most common tools, including shortcuts on the navigation bars. Iâ€™ll be describing some of the most basic ways to access tools so that you can get familiar with the landscape, but on your own, youâ€™ll find lots of ways to access your favorite tools.